Students in the Master of Science in Nursing Entry (MSN-E) program will be required to complete 1395 clinical hours in the curriculum. Students will be assigned to clinical facilities and to a clinical faculty member and will complete clinical experience hours at acute care hospitals, behavior health and community health clinics. Clinical experiences will begin in the first semester of the program. As a front-line leader and working with other nurses and the interprofessional team, the CNL engages in a systems-based approach to improve patient safety, clinical outcomes and quality improvement. The goal of the CNL is to assure high quality, safe and cost-effective health care. Students will be required to complete between 405 to 495 clinical experience hours. Clinical experiences for this track can take place at any point across the continuum of health care. Students will be precepted by a clinical nurse expert in a selected practice setting to meet identified role competencies. A clinical professor will work with the student and preceptor to monitor progress throughout the practice experience. The clinical experiences will position students for new and unique employment opportunities after graduation. The CNL clinical experience is a requirement of CNL certification. The ANL is an organizational and social architect for high-performing health care settings. ANLs work collaboratively with other nurses and interprofessional leaders. The ANL creates the environment and ensures the structure and resources for high-quality, safe, and cost-effective health care. Students will be required to complete between 225 to 315 clinical experience hours. Clinical experiences for this track can take place at any point across the continuum of health care. Students will be precepted by a leadership expert in a selected practice setting to meet identified role competencies. A clinical professor will work with the student and preceptor to monitor progress throughout the practice experience. The Ambulatory Care Nurse (ACN) coordinates care for individuals in outpatient clinical settings as well as facilitating and managing health care. The Master’s prepared clinician or leader critically utilizes current and relevant evidence to ensure safe delivery of quality patient care. Additionally, the ACN evaluates patient outcomes, assesses risk, and provides patient education. 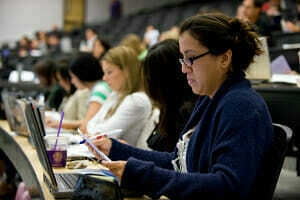 Students will be required to complete between 225 to 315 clinical practice hours. Mentorship by nursing experts in various practice settings will guide acquisition of skills to meet ambulatory care competencies. A clinical professor will ensure a quality education by monitoring progress throughout the practice experience while aligning didactic content from the curriculum. As an FNP-track student, you will complete 675 precepted clinical hours in your community. Working with Medical Doctors (MD’s), Osteopathic Physicians (DO’s) and Nurse Practitioners who agree to mentor you through this skill-building phase, your local preceptor will make sure you receive an outstanding learning experience at a site as close to home as possible. Your clinical experiences focus on ambulatory, primary-care practice. Geriatric, adult, pediatric, obstetric and gynecologic populations are all included in your clinical rotations that take place in a range of settings, including private practices, community clinics, public health facilities, and some specialty clinics. During your seminar weekends, classes and skills workshops introduce skills and intellectual concepts that you will integrate into your clinical rotations. This partnership between the academic and clinical worlds not only prepares you for clinical practice, but also positions you for employment opportunities. Most students obtain precepted experiences at multiple sites to obtain the widest possible experience in practice patterns, skill sets, and specialties. Clinical faculty will perform evaluations each semester to determine your progress with preceptor interactions, and patient encounters to ensure your experiences meet our rigorous standards. You will have your choice of working in community clinics, private practices, urgent care sites, rehabilitation centers, hospitals, Indian reservations, military sites, specialty clinics, or family practices within your home state.